SMS message were being sent across Batticaloa calling Tamil and Muslim youth to confront the violent Sinhala-Buddhist Power Force (Bodu Bala Sena), which is marching towards Batticaloa with a vow to erect 10 Buddha statutes in the Tamil-speaking Batticaloa district. The BBS monks have managed to reach Punaanai, outmanoeuvring SL policemen at Ridhi-thenna, a locality between Welikanda and Punaanai. Sinhala youth have also been mobilised from Polonnaruwa and Ampaa’rai to accompany the marching monks. In the meantime, informed sources said Ampitiye Sumanarathna Thero was recently spotted being in possession of a pistol beneath his saffron. The sources has also revealed that the monk was initially a recruit of the so-called ‘National Intelligence Bureau’, especially in the early 1990s and he was posted to Batticaloa with a particular mission. Tamil youth confronting the march by Sinhala extremist monk Ampitiye Sumararathna thero in the city of Batticaloa on Saturday. Tamil Parliamentarian S. Yogeswaran is seen talking to SL Police officials. SL military was also deployed against the protesting Tamil youth in the city. On Saturday, Ampitiye Sumarathna thero was preparing to march towards Punaanai from Batticaloa to join the BBS monks. 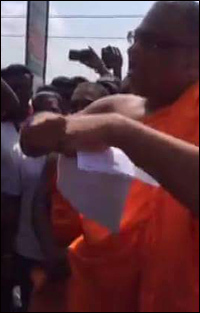 SL Police blocked confrontation between the monk-led Sinhala youth and Tamil youth on Saturday at Batticaloa city. The Sinhala youth had come to Batticaloa to confront protesting Tamils, well in advance. In the meantime, SL Police also tried to stop the BBS monks marching through Welikanda in Polonnaruwa district from entering Batticaloa district. However, the leading monks of BBS tore down a legal notice, which informed the extremist monks not to proceed with their march. The BBS monks further vowed to join hands with the violent monk in Batticaloa city and proceed their march forward towards Pankudaa-ve’li and other places in Batticaloa district to erect Buddha statues. The news of Ampitiye Sumarathna thero being in possession of a handgun was known for some time, the informed civil sources in Batticaloa said adding that the monk was an intelligence agent of Colombo’s military establishment. Ampitiye Sumanarathna thero has allegedly received ‘counter-insurgency’ military training before he was sent to Batticaloa in early 1990s, the civil sources said. The monk, who is very fluent in Tamil, has not gone public demonstrating his skills of speaking Tamil. His controversial behaviour, especially his abusive language was intended as propaganda in Sinhala to the extremist sections in South, the sources said. He has scored popularity among the Sinhalese in traditional and social media for quite some time. Tension prevailed in Batticaloa city on Saturday afternoon and it has not been possible to assert the full strength of the Sinhala youth being mobilized by Colombo’s intelligence establishment to back the monk in Batticaloa. Former and current Tamil parliamentarians from Batticaloa district were present in the city to exert pressure on the SL police to block the extremist monks from erecting controversial Buddha statues. However, Muslim politicians didn’t show up at the protest site. Emboldened with the lack of mobilisation from Muslims, the monk has also vowed to march towards Kaaththaan-kudi, the main city of Muslims.